The Meditation Series was created for the use of contemplating well-being and balance within the body. Focusing or meditating on each chakra in synchronicity with each corresponding colour helps maintain this balance. We operate from our system within when we present ourselves to the outside world. Each area of our body has a specific job to do despite the changes that are constantly taking place. The order and demands of life are always changing and it is our task to adapt as best we can. By using guided visualization aided by sight and sound we help conquer dis-ease and accentuate well-being. These collages represent many hours of gathering, clipping and pasting from a wide variety of magazines. The end products are my interpretations of each colour using the available splashes of colours in combination with images created by many other artists. They are a grouped effort. These are available as Prints (8x10) or Cards (5x7). Please email for current prices, quoting the stock number found beside each item. For quality results a Futura gloss card stock is used in the production of all cards & prints. Each card includes an envelope and is individually packaged in a plastic sleeve. Each print includes back matting support and is individually packaged in a plastic sleeve. The entire Meditaion series of Cards is $29.00. Single cards are $3.75 each, but if you order a selection of 4 cards, it is $12.00 Prints are priced at only $8.00 each. Every order over $40.00 (excluding shipping and handling) includes a free print of choice or two cards. If you would like to order custom sized prints, please Contact Us. 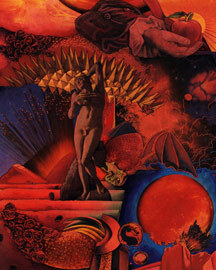 The Red Chakra is the sacral root that keeps us down to earth and grounded. We draw earth energy through our roots - the feet that support us. A good foothold provides that stability when we need to make a stand. Establishing a strong base to work from is a basic survival necessity for fiery Red. Red is primal, passionate, and the “defining colour of life”, like the blood that carries the adrenaline rush in a fight or flight situation. Red is our desire centre. Its gives the strength to survive, the will power to succeed, and the self-control to be assertive when facing obstacles that stand in the way. Come alive – new journeys begin. 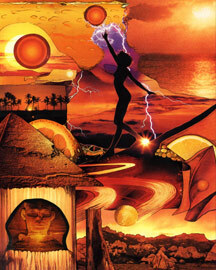 The Orange Chakra is action or physical movement, reacting to stimuli or the creative juices. Sexuality and creativity fuel the passions of life that motivate us. Orange is always on the move - inside reactions circulate body fluids, while outside actions feel the situation out. Orange is energetic like the rays of the rising or setting sun. It renews daily and retains an afterglow to keep the energy going. You don’t have to physically move mountains, the feeling that you can is the driving force to remember. Orange is our pleasure centre. It thrives on a good balance of exercise and nurturing and keeps the body in circulation and part of things. Feel alive – and create. 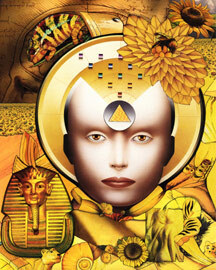 The Yellow Chakra or solar plexus is the sun of our being. It is a solar hub of activity radiating energy throughout the body while being fueled by the digestion of food. Energy is always supply and demand. Our emotions and thoughts help direct the use of fuel. Good food for thought is essential when feeding all elements of the body, mind, and soul to meet life’s changes. Yellow is vitality connected with rational thought – gut instinct is an energy saver! Yellow is our power centre. It influences the applications of learning while giving us the courage and power for making decisions and choices. It reminds us to think before we act. Life is about choice and direction, so direct choice. Radiate life – and grow. The Green Chakra is at the heart of things. It balances the mental and physical activities of our bodies to maintain well-being. Health and wealth are paired with giving and receiving. Follow your heart when it has a good lead. Take in the green of nature for a breath of fresh air – your lungs will return the favour. 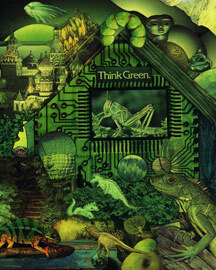 Green is thoughtful, contented with life and willingly shares with others – a good act to follow. Green is our love centre. The energy from the heart is the strongest – heart felt. Its nature and nurture qualities are life sources and lifesavers. Healing dis-ease and bringing harmony and peace to the well-being is a balancing act. Love life – and find fulfillment. The Turquoise Chakra is the defense system against dis-ease. It manages the ebb and flow of the body’s fluids from culmination to elimination. Prevention is better than a cure and de-stressing is a key factor in immune efficiency, right down to the cellular level. It is our quality of life energy. Turquoise keeps it guard up to monitor and protect against bacteria, viruses, and other body invaders of dis-ease, so our resist-ance is strengthened. A heal-thy self comes from within. Turquoise is the health centre. Its T cells with their healing energies expel toxins from the body to repair and restore health. Live life – and live well. The Blue Chakra is the voice of self-expression. It is creative, free flowing, and finds strength in the freedom of speech. Speaking the truth and integrity are important true blue qualities. Remaining cool, calm, and collective while listening to others ensures a clear blue sky. Blue is guided by words of wisdom and makes every word count, whether it is written or spoken. 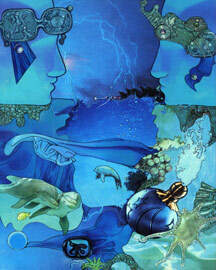 Blue is a confident skillful negotiator when using its energy of peace to face the wild blue yonder. Blue is the communication centre of cause and effect. The effective B-cause is the voice of reason to say what you mean and mean what you say. Live inspired – sing with the bluebird of happiness. 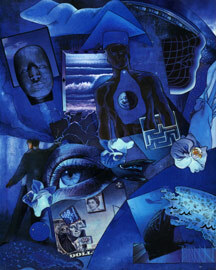 The Indigo Chakra is the third eye of vision. Three is a crowd so the third eye isn’t visible. 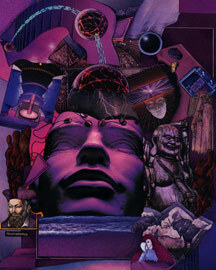 While two eyes see, the third eye is the over-seer, the mind’s eye. It’s in we go with in-dig-o, on a vision quest to access inner knowledge. Through this portal to our inner being the seeker looks for answers within. Indigo is intuition, extra-sensory perception and optical illumination from inside out. The eyes are the windows to the soul and the third eye mirrors the soul’s reflection. Indigo is the centre of sight and insight. Clairvoyance provides a good outlook on life. Just focus, and hocus pocus things will happen without a shadow of a doubt! Live intuit – be in-to-it. The Purple Chakra is the crowning chakra that lifts our spirits. This royally chosen colour takes a sacred place among many faiths. 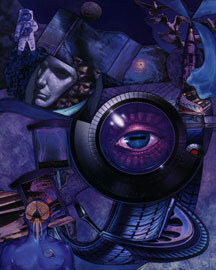 The purposeful Purple helps us rise to the occasion above the bonds of materialism. Life is easier to integrate and unify when looking from a new perspective. Purple is the sacred colour that helps to illuminate and elevate the self towards enlightenment. Purple is the centre of divinity that is open to the universe. This ultra-violet cosmic energy regulates an open mind to the flow of things from within us to worlds beyond. Meditation not medication purifies and clarifies the mind so it can reach a higher level of consciousness. Life is sacred – let the light shine in. Copyright © 2006 Myriad Art & Trisha McLean. All rights reserved.